*HIGH SEASON: Easter, July and August. *Extra bed in bedroom: 15 euros/person/night. Our house is located in Usetxi, a small village of the North of Navarre located 25 kilometers from Pamplona and 5 from Zubiri. It has two wide double bedrooms, spacious living-dining room, glassed lookout where we can observe the Valley of Esteribar and all the communities. The environment is very quiet and it is surrounded by nature, with the possibility of make a small marked path of about 4 kilometers length, suitable for everyone. Many possibilities of bike paths by the area, as well by road as by mountain. If you wish we can come close to areas like the Forest Quinto Real in 15 min by car, or to the famous Irati Forest in one hour. The lovers of the table will have the chance for coming to the wonderful restaurants of the area where will find possibilities of all pockets. We wait for you convinced that you will like our house and our land. 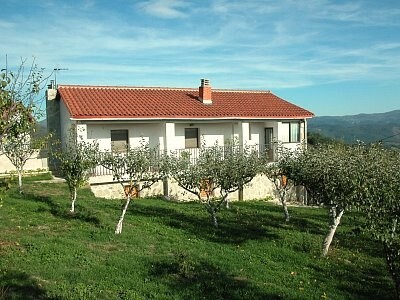 It has a wide garden with fruit trees and barbecue. 2 double bedrooms, living-dining room, equipped kitchen, 1 bathroom. Glassed lookout with excellent views. Close garage. Mount Quinto Real, Roncesvalles, Forest Irati, Belagua, Lordship of Bértiz, Caves of Urdax and Zugarramurdi, Territory Basque-French, Castle of Olite, Pamplona. Hiking with marked routes, Cycling.